NB: The above John Qualtrough was eldest son of John Qualtrough and Margaret Comish and was baptised in Arbory, Isle of Man on 2 September, 1788. One day when my mother and I were talking the conversation turned to the two small watercolour portraits which hang on her lounge wall and are inscribed John Qualtrough aged 57 years and the other Margret Qualtrough (Note the spelling of Margret). I had always assumed these had been acquired by some past member of the family perhaps for decorative reasons and handed down, but what my mother then told me was to set me on a journey of discovery. The portraits had been given to my mother by her grandmother when I was born saying that as first born they should eventually be passed on to me and that they were portraits of past family members. In later years my mother had tried to find out who they were and had had the portraits dated by an expert to the 1840's principally from the style of dress. She then tried to obtain a copy birth certificate for her grandmother who was called Cammello Triphook Phillips but the records office told her they could not trace it, and so the mystery continued. I had recently retired from business and so had some time available and elected to take up the challenge and find out just who were John and Margret Qualtrough. Little did I realise how caught up in this genealogy game I was about to become. My starting point was what was left of an old family bible, that is sheets recording births marriages and deaths, which had been started by my great grandmother Cammello Triphook Phillips following her marriage to William Benjamin Evans in 1853. This gave both her and her husbands date of birth and their marriage details. Also details of their children and family deaths which included Cammello's mother Mary Ann Phillips who it recorded was interred in the family grave in Smithdown Road Cemetery, Toxteth Park, Liverpool. I then set about trying to obtain Cammello's birth certificate which my mother had in the past found so elusive. From the date in the family bible extracts I was able to locate her birth on the national register and found that her name had been recorded as Commello and not Cammello. So this was why my mother had been unable to obtain her birth certificate. In fact her name seems to have changed throughout her life, on the 1891 census she is Cammelia and on her grave stone it is Camilla. I duly applied for and received the birth certificate which gave her mothers name as Mary Ann Phillips formerly Qualtrough so there it was the link to the Qualtrough name. 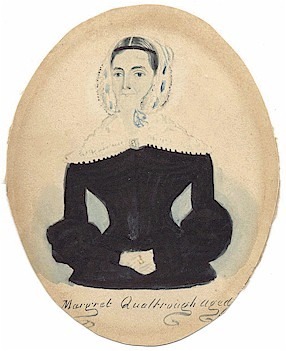 I then started to search the Qualtrough name on the internet and came across the Qualtrough web site ( www.qualtrough.org) I was absolutely amazed at the quantity of information and using this site and others was soon able to identify Mary Ann and her parents John & Margret Qualtrough. I obtained the marriage certificate of Mary Ann to Richard Phillips which was witnessed by John and Margaret Qualtrough whose own marriage in 1815 is recorded in the parish register of St. Paul's church in Liverpool. John Qualtrough was born in Arbory Isle of Man in 1788. He was a Master Mariner and came over to Liverpool and in October 1815 married Margret Young at St.Pauls Church Liverpool. His signature is very stylish but she clearly couldn't write as she had made her mark with an X. They had six children the first born being Mary Ann who was born in Liverpool in 1817 and christened in September of that year at St. Peters Church Liverpool. Mary Ann Qualtrough married Richard Triphook Phillips also a Master Mariner in September 1839 at St. Philips Church Liverpool. He was born in Angle, Pembrokeshire, Wales in 1811. At the time they were both living at Stanhope Street in Liverpool with Mary Ann's parents John and Margret Qualtrough and the family were still living there two years later as recorded on the 1841 census although Richard Phillips is not recorded but may well have been away at sea. How many children they had I do not at this stage know; what I do know is that one of their children was called Cammello Triphook Phillips, my great grandmother, who was born in December 1853, and christened in St. Peters Church Liverpool in May 1854. On Christmas day 1875 Cammello was married to William Benjamin Evans, a Ships Smith, at St. Silas Church, Toxteth Park, Liverpool, and in 1881 they were living at 40 Pickwick St, Toxteth Park, together with their three children. At the same time Mary Ann & Richard Phillips were living down the road at 52 Pickwick Street he was then aged 70 and she 63. In August 1888 Cammello had a daughter Florence Vincent my grandmother and in 1891 from the census Cammelo and her family were living at 5 Dovey Street, Toxteth Park and living with them was Mary Ann Phillips then aged 74, recorded as living on her own means, her husband Richard presumably having past away. Mary Ann died at 5 Dovey Street in November 1900 and was interred in the family grave in Smithdown Road Cemetery, Toxteth Park, Liverpool. Florence Vincent Evans married Frederick Wilkinson, a correspondence Clerk, in June 1913 and had one daughter, Freda Helen, my mother born February 1920 in Crumpsall, Manchester. Her mother Florence died in October 1923 when my mother was three. My grandfather Frederick Wilkinson went on to a career in senior management with the Co-operative movement and was awarded the MBE by Edward VIII just prior to his abdication in1937 and received the award from George VI. My mother, who was a teacher, married Arthur Preston Robinson, a draughtsman in November 1944 and settled in Lytham St Anne's, Lancashire where I was born in May 1946 and I have a brother Ian who was born in October 1949. I married my wife Margaret in October 1968 and we have three children. I spent my working life in both public and private Industry and recently sold a business I set up in 1988 and have retired from Industry and am now pursuing other interests. 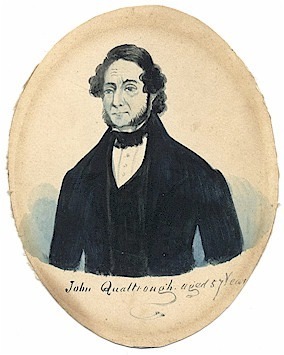 I am now the same age that John Qualtrough was when his portrait was painted in 1845 and 158 years later intend to investigate further his life in particular his exploits as a Master Mariner. I am fortunate living in the Manchester area to be close to Liverpool and its Public Records Office and Maritime Archives and look forward to painting a written picture to go with the that watercolour that inspired me to begin this journey.